This week we’re running the BOHS module M201 Thermal environment and non-ionising radiation (including lighting). This is one of the optional modules and most hygienists will only come across problems related to these topics on rare occasions. Consequently, after the course, it can be difficult to keep up to date with new research and developments. 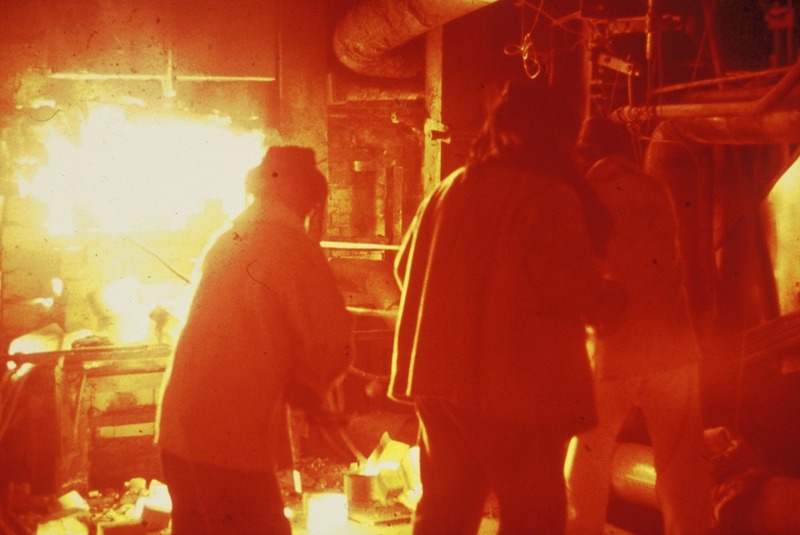 The TLVs were, however, updated a few years ago and now place less emphasis on work:rest regimes, adopting a more thorough, structured approach to reducing and managing the risks from work in hot environments. ACGIH have produced a flow chart that summarises the new procedure (a copy can be downloaded from Professor Thomas E. Bernard’s website here or click on the diagram below), but it is fairly complex can be difficult to follow at first. I’ve produced a summary presentation on the TLV, which includes some worked examples for use on our course which I’ve uploaded to Slideshare . I’ve embedded it below, but you can view it on the Slideshare site here, from where it can also be downloaded, if you prefer. All of these parameters* can be quantified, either by measurement or estimation, but it is very difficult to make sense of the results. We need to find a way of pulling them together so we can decide whether we have a problem and, if so, how big the problem is. 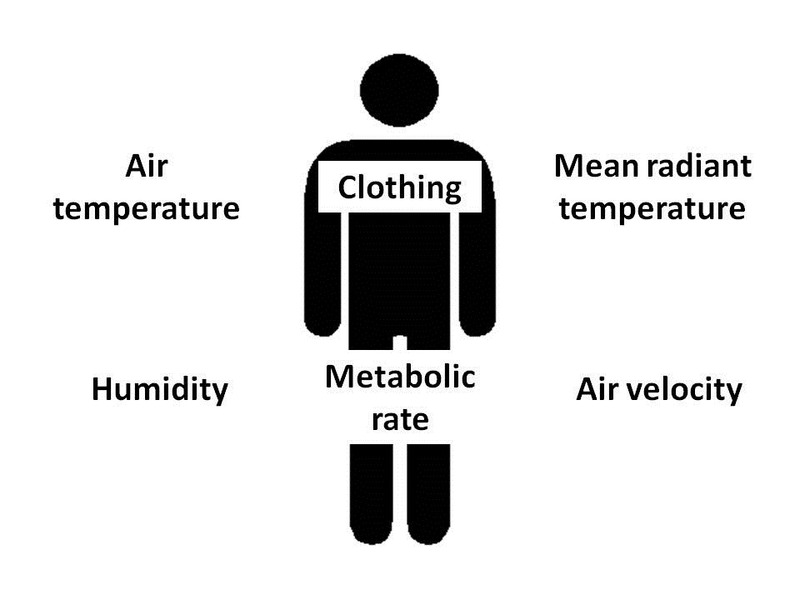 Over thirty different indices have been developed over the years, taking into account some or all of these parameters, which aim to integrate the relevant variables into a single value which relates to the stress placed upon workers by the thermal environment they encounter. These indices have differing degrees of success in meeting the objective of a single number descriptor for any situation. Each has a range of environmental parameters over which it is applicable, but outside of this range accuracy is questionable. Although they have to be covered during the course, these indices, except for WBGT, are out of date and, in practice, are no longer used (although ET is still applied in the mining industry in the UK and some other countries). In the main, they are of historical interest only. 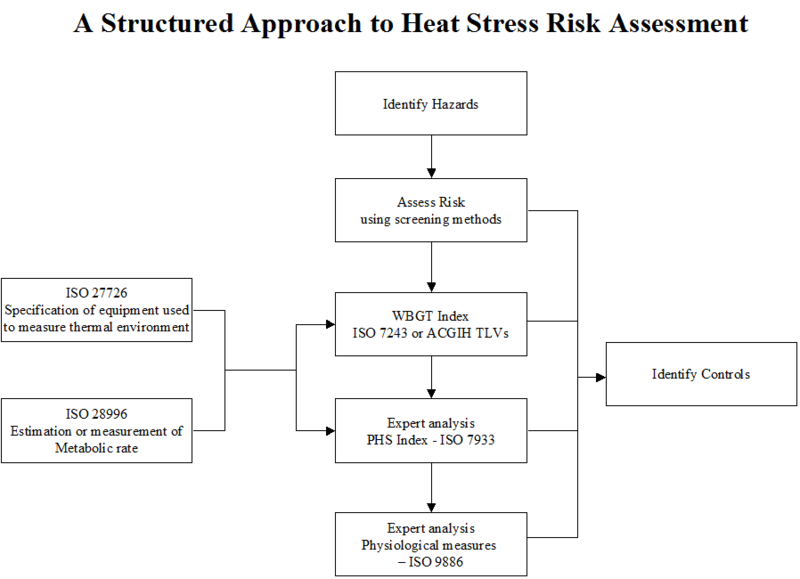 The relevant indices for modern practice are WBGT and the more complex “Predicted Heat Stress” (PHS) index described in International Standard ISO 7933:2004 “Ergonomics of the thermal environment – Analytical determination and interpretation of heat stress using calculation of the predicted heat strain”. The latter is not mentioned in the current BOHS syllabus. PHS is extremely complex and intended to be used by experienced ergonomists or occupational hygienists. The index determines a duration limited exposure time, which is the time taken for either the rectal temperature or the cumulative water loss reaches specified maximum values. The lower of the two values is used to determine the allowable exposure time. Solving the PHS equations requires the use of a computer program and should only be attempted by someone with appropriate experience. In practice, for situations where there is a potential risk from heat stress and strain, it is best to adopt a structured approach. Undertake screening using a simple method that can be used by management and workers to identify potential risks from heat stress and strain and determine whether further work is needed. The HSE have a useful checklist that can be used during a screening survey that can be downloaded from their website. Following the survey if it is clear that there is no risk no further action will be required. Also, if there are obvious problems it may be possible to specify appropriate controls at this stage. The HSE checklist can help with this. If the risk cannot be adequately assessed during stage 1, carry out a basic analysis taking appropriate measurements and interpreting them using WBGT. In many cases it will be possible to use the guidance provided in the ACGIH TLV for heat stress to determine whether the risk is significant and what controls and other measures could be implemented. For very complex cases, where it is not possible to adequately evaluate the risk during the previous two stages, commission an expert analysis which is likely to involve measurements/estimates of physical and/or physiological parameters and use of more complex indices. * Other factors can also influence the risk too, such as posture, body weight, medication. A fully comprehensive analysis would consider them too, although it is not so easy to quantify them and including them introduces complications.